This time around we’re going to be looking at some second basemen! 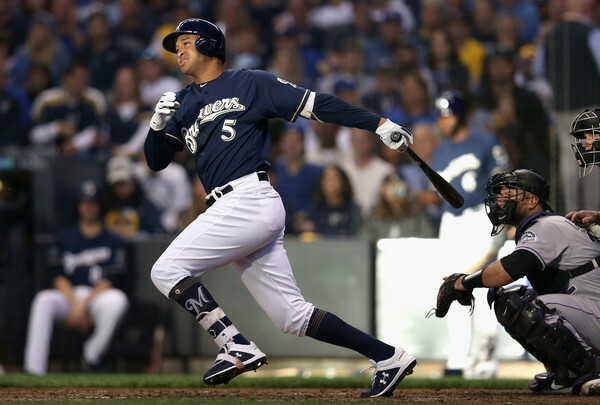 Let’s get you straight into a buy-low candidate for 2019: Jonathon Schoop. I’ll never pronounce it Scope, for the record, always Shoop. What’s important about Schoop’s 2018 is it appears to be very fluky. I would not expect him to repeat his .233/.266/.416 triple-slash from 2018 and I’ll guess he’ll be much closer to his 2015-2017 three year average of .280/.316/.479. Here’s why. Schoop had a wOBA of .536 with a 13% HR/FB ratio on the most premium launch angles last year after running a three year average of .884 with a 38% HR/FB ratio. 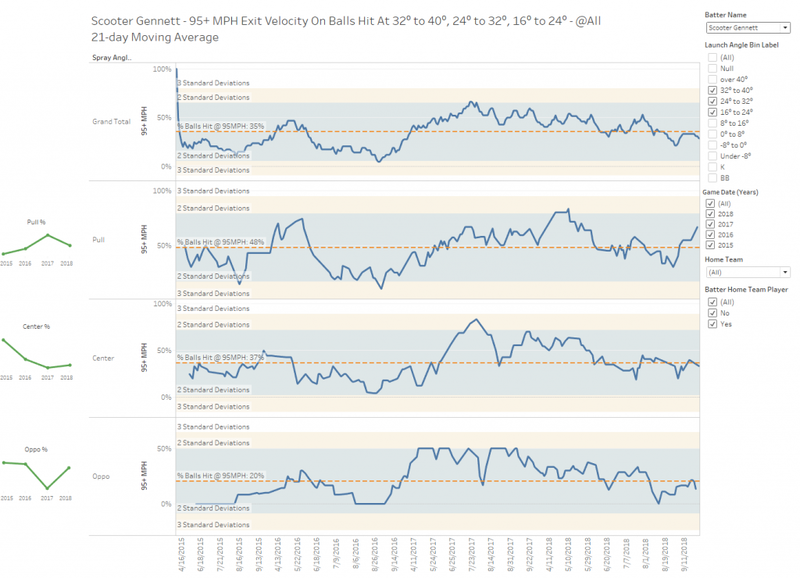 We can also look at his total fly ball profile to see that he had his lowest HR/FB ratio in the last 4 years (19%) driven by both a lower pull-field rate and lost exit velocity to centerfield (84.3 mph). Much of this may be attributed to a right oblique strain that occurred on April 15, 2018. It took him until almost July to recover his exit velocity to the pull field. There’s just nothing here suggesting that Schoop should be declining thus my strong rebound prediction. 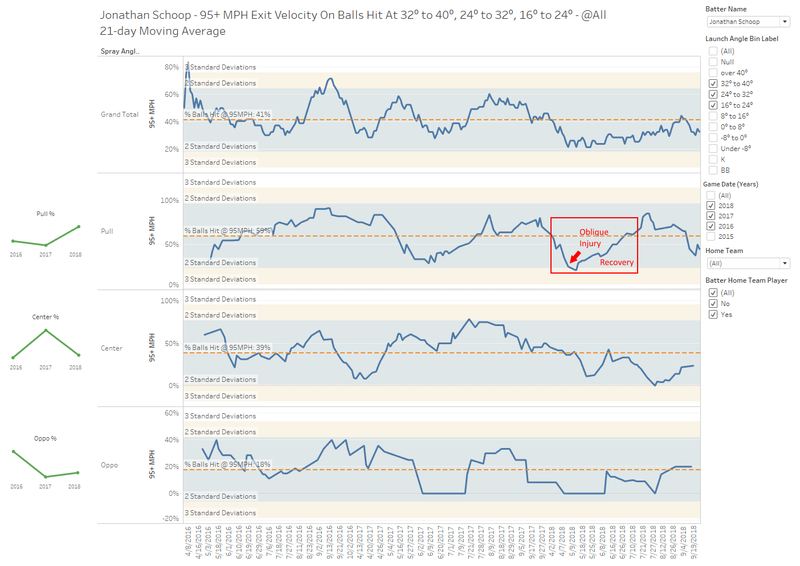 Though Schoop was able to recover his exit velocity to the pull field, he never did get back to his 2016-2017 levels of exit velocity on balls hit to centerfield. 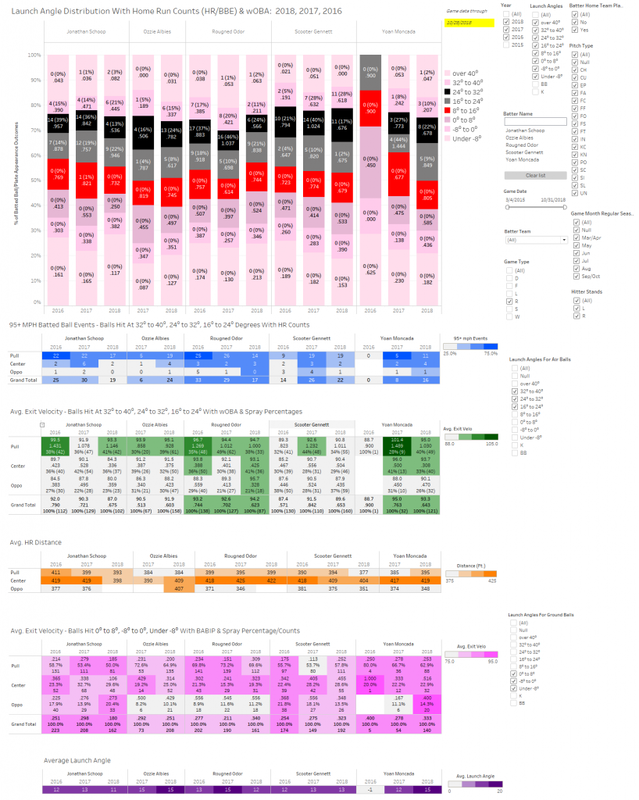 It makes me consider the possibility that he was never fully back to 100% in 2018 when we look strictly at the data. Now you may be asking yourself “what about his abysmal .233 batting average?” I’m glad you asked. Let’s check into his ground ball profile as well. After running a 3 year GB BABIP of .276, it dropped to .180 last season. This was driven by both his pull-side ground ball drop (estimated loss of ~5 hits) and the balls hit back up the middle (estimated loss of ~9 hits). This would have brought his triple-slash up to .266/.293/.446 without accounting for any of the unluckiness in his fly ball profile. Yoan Moncada has a ton of swing and miss to his game currently, but it’s fun to compare him to another slugging second baseman in Javier Baez. Thus far Baez has an advantage on Moncada in home run rates, specifically to the pull field where Baez holds a 45% to 27% HR/FB rate edge over Moncada. This data tells me Moncada isn’t really tapping into his game power yet. I know there is a lot of fatigue around Moncada this offseason, so if you’re looking to buy low, this would be the time. I swung a couple trades with Moncada myself this offseason, in one move sending him off for a combination of Jesus Aguilar and Carter Kieboom as the main pieces and bringing him onto another squad of mine in exchange for Keston Huira. At this point, I’m both “in” and “cautiously out” on Moncada, especially in non-OBP leagues. ODOR CAN WALK! WAIT, DO WE WANT THAT? 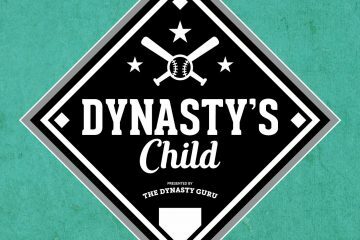 Rougned Odor has been rollercoastering through the second basemen fantasy baseball rankings since his debut in 2014. Sometimes masquerading as clean swinging decent K-rate guy (2015), other times a 30 home run all-or-nothing type (2017) and then last year he doubled his walk-rate and also had a similar excursion to Jonathon Schoop in relation to some of his fly balls, which saw his home run rate drop to its lowest level since his age-21 season in 2015. While Odor always has a chance to be a slugger, his very low line drive rates will always handicap his batting average along with his three-year rise in strikeout rates. Here we can see the real change in Odor’s walk rate. Starting at the end of the 2017 season and continuing through early 2018, Odor has shown statistically significant improvements in his walk rate over a season-long period of time. While this is important for OBP leagues, if you’re looking for more counting stats this could actually be a negative change in fantasy value for you. As I mentioned before, Odor had a similar excursion to Jonathon Schoop in his 24-32° fly balls. 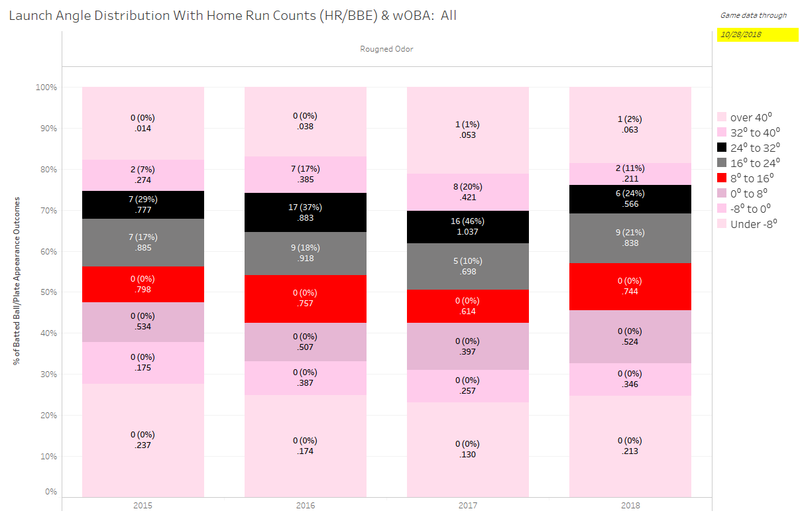 Much like Schoop, I don’t expect Odor to replicate the .566 wOBA on the most premium launch angle for home runs, especially given the fact that he didn’t hit the ball with any less exit velocity in 2018 when putting the ball in the air. Only the new-found walk rate should keep his HR totals under 30 in 2019. Gennett went from hitting 31/18/15% of his fly balls at 95+ mph to Pull/Center/Oppo in 2016 to 55/54/44% in 2017. We can take a look at how this impacts his expected slugging and home run totals in a couple of ways. 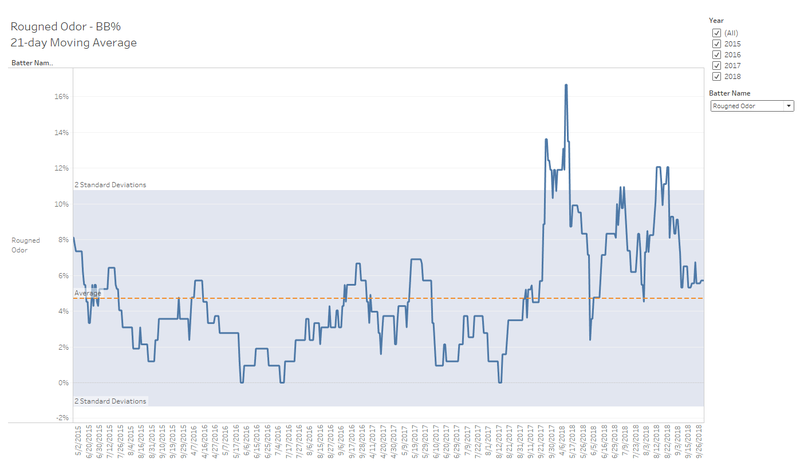 The first is this time series view of his power surge as a 21-day rolling average. Gennett didn’t maintain as much of his gains from 2017 in 2018, specifically to center and the pull field. The second way we can do this is by looking at the distribution of exit velocities in each launch angle bin specifically to the pull side. Here we can see the cause of the drop off in home runs last year, where instead of hitting 53% of his 24-32° balls at 100+ mph (almost guaranteed home runs), it was only 23%. While Gennett doesn’t always hit the ball with great power in the air to the pull side, he does it frequently enough to keep him as a 20+ HR threat, but it doesn’t mean we should expect a return to the 25+ HR days of 2017. 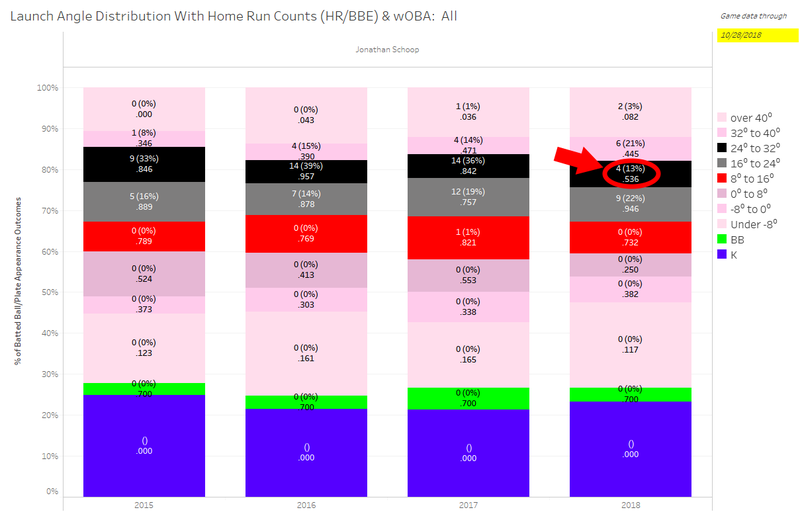 The other note to beware on regarding Gennett is that his batting average was boosted in 2017 due to the HR/FB spike and in 2018 due to an unsustainable .323 ground ball BABIP. Be prepared to see his average drop back down to the .285-290 range. This is still an above-average to elite batting average these days, but don’t expect a repeat of the .310 from last year. Gennett does run a higher-than-average line drive rate, which keeps the floor on his batting average high. Ozzie Albies came through with a power barrage that most didn’t see coming. After continuing to put the ball in the air at a 40% clip in 2018, Albies saw his HR/FB rate increase in two important bins. The first was in the 24-32° bin. I added Javier Baez as a comp again for power purposes. The way that Albies pulled the ball in the air at these ideal HR launch angles appears to be a very sustainable rate. Albies homered on 11 out of 21 balls pulled at these launch angles and his exit velocity looks very similar to Javy. Barring a change in the quality of contact on these fly balls, Approximately half of his HR total from 2018 looks like a safe bet to repeat. Let’s also take a look at the next higher bin up, the 32-40° launch angles. These balls require a bit more power to hit out of the park. Again, if we use Baez as a benchmark, he’s run a HR/FB rate around 55% with approximately the same exit velocity profile as Albies. Given that Albies is just 22 years old, we should assume two things about the youngster. The first is that there could be a high standard deviation around his batted ball profile as he matures. This means he could see his quality of contact wax and wane as it did throughout 2018. 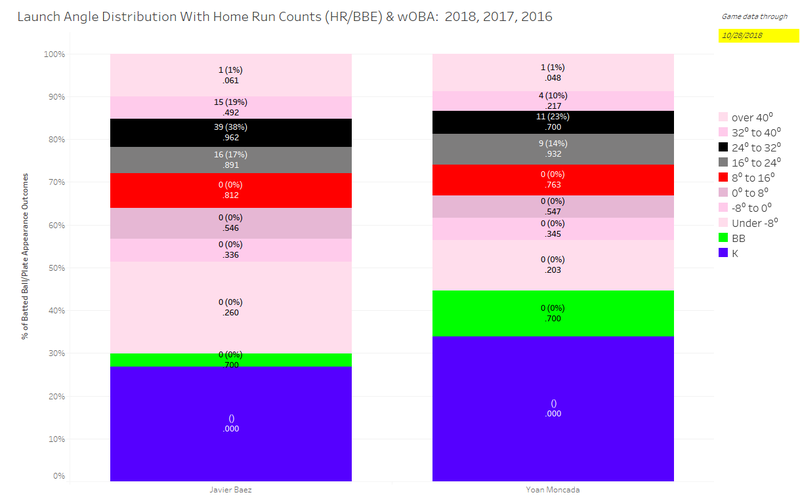 Second, there is still room to grow for Albies – maybe there’s some Jose Ramirez in there somewhere if he can maintain his hard-hit air balls for the entirety of the season.